Chesterfield House was built between 1747-52 by Philip Stanhope, 4th Earl of Chesterfield, and demolished in 1937. It stood in Mayfair on the north side of Curzon Street, between South Audley Street and what is now Chesterfield Street. 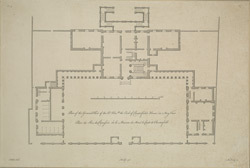 This plan was drawn from the original designs by the architect James Ware and published by James Gandon and John Woolfe in 'Vitruvius Britannicus'. The title appears in English and French at bottom centre, next to the scale bar.